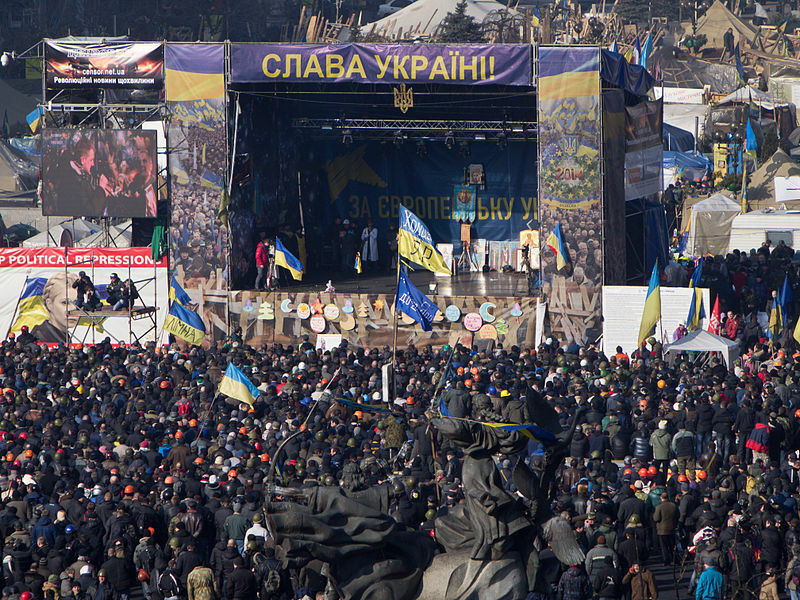 With the recent events in Ukraine, the spectre of nationalism has returned to Europe. After a few years of relative calm, separatist movements in Scotland, Spain and Italy have come to the fore, and the territory of a sovereign state has been annexed, in the name of the ethnic origin of roughly 60% of its inhabitants. While it is flippant and mistaken to describe the separatist movements in Western Europe as being at all similar to the Russian takeover in Crimea, the return of ethnic politics does call into question the security of the EU, the ambitions of Russia, and the future of Europe. Photo Credit: CC-BY-SA Wikimedia Commons. Defining the borders of states based on the ethnicity of their inhabitants is nothing new; most of Central Europe was created along ethnic lines. Hungary, the Balkan States, Austria, The Czech Republic and Slovakia were all created from the collapse of larger states, as were the Baltic States. Defining a nation by language or culture is not in itself a problem, as long as it is used in conjunction with international law and other considerations. If a state is annexed purely on the basis of ethnicity, then it merely lays the foundations for strife, conflict and future trouble. Crimea has been annexed for ethnic reasons; this is indisputable. In his speech to the State Duma, President Putin stated that “Millions of Russians and Russian-speaking people live in Ukraine and will continue to do so. Russia will always defend their interests using political, diplomatic and legal means.” While this statement does have a point, namely, the necessity of protecting the interests of Russian citizens, it also includes Russian speakers amongst those who need to be protected by Russia. Under international law, Russia has no jurisdiction over these individuals; they are Ukrainians who speak Russian, rather than Russians. Even if they are part of the Russian diaspora, the same point applies: legally, they are Ukrainian citizens. Therefore, they are subject to the authority of Kiev. If Russia has concerns about the safety of Russian speakers in Crimea, then they should raise them with the UN, or an international body: they cannot legitimately annex the territory of a foreign country through force. The international community has chosen to respond to Russia’s actions through sanctions and strong criticism; this is the most appropriate route to take. Military action, though tempting at first, is inadvisable, if not impossible. Yes, Russia has violated Ukrainian territory. And yes the USA and the UK are bound by the Budapest Memorandum to guarantee Ukrainian sovereignty. But no politician would be so astronomically stupid as to deploy troops against Russia, or indeed as a defence force in the Ukraine. Somewhat regrettably, as far as military action is concerned, the USA and UK should stand back, and let the diplomats sort it out. The provision of military support to Ukraine, even in an advisory role, would risk sparking a conflict with Russia, or at the very least severe sanctions from Moscow. Despite the view, articulated in some political circles, that Russia is no longer a threat to NATO, Russia has one of the largest armies on earth, a substantial nuclear arsenal, and an experienced, canny leadership. Russia also supplies a third of Europe’s natural gas, which makes it uniquely able to disrupt European economies, and by extension, the world’s. Military action would be suicidal for the West, and detrimental to the very people it would purport to help. As Russia maneuvers to regain its former status as a major world power, Europe will need to position itself accordingly. With the US foreign-policy pivot towards Asia, the burden of security in Europe is now squarely on the shoulders of the EU. This poses a challenge for Europe, which it will need to meet over the next few years. After WW2, the European movement emerged as an attempt to prevent the sort of divisions that tore Europe to pieces during the 20th century; the situation in Ukraine will be a test of how successful this attempt has been. Lewis Thomas is a junior at the OHS.